How do I use the SaddleClip in my training sessions? SaddleClip is connected to your phone via Bluetooth. Using the Equestic app on your mobile, select which horse you are riding. Turn your SaddleClip on and off and view your results. How do I know if the SaddleClip is working when I’m riding? When you are riding, most of the analysis is performed in real time on your mobile phone. A counter indicates how much time has passed. In addition, the blue LED light on your SaddleClip blinks when it is turned on. Do I have to carry my mobile phone with me when I’m riding? No, you don’t. Equestic SaddleClip can buffer rides up to one hour long. You only need your mobile phone to turn your SaddleClip on and off. At the end of your training session, the SaddleClip needs some time to process the data, this takes approximately a third or a quarter of the time ridden. For 45 minutes of riding, the SaddleClip will need about 10 to 15 minutes to process. This process has to be completed before you can start a new training session. Will my SaddleClip fall off when I’m riding? No, it won’t. We have carried out exhaustive tests: on bucking horses, show jumping courses with jumps of up to 1.60m and on eventing horses. Up to now, the Equestic SaddleClip has never fallen off. What exactly can I do with the SaddleClip? We measure and analyse: 1) Time spent training at each gait 2) Time spent training on the left and right hand 3) Number of jumps / Number of jumps approached from the left and the right 4) How powerfully your horse pushes off at the walk/trot/canter and how this develops over the training session 5) How powerfully your horse pushes off at the walk/trot/canter and how this develops over a longer period of time 6) The rhythm at the walk/trot/canter and how this develops over the training session 7) The rhythm at the walk/trot/canter and how this develops over a longer period of time 8) The number of transitions 9) The symmetry of movement at the trot, i.e., how evenly the diagonals move in comparison to each other. This is measured both over the long term and within one training session. The Equestic SaddleClip has another important feature: data on a horse (all training results and analysis) can be shared with all team members, such as its vet, trainer and owner. Does it matter which side of the saddle I attach my SaddleClip to? 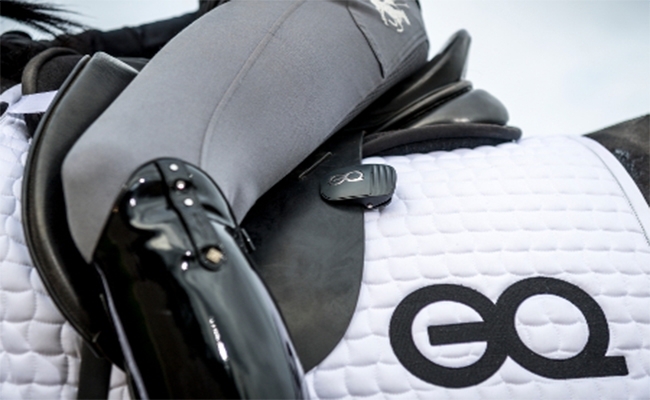 The SaddleClip must be attached to the left saddle flap. It doesn’t matter if it is at the top or the bottom of the flap. It is important to position SaddleClip horizontally; at a maximum angle of 45 degrees. If your SaddleClip is not positioned correctly, the Equestic app will let you know. Who is the SaddleClip intended for? The Equestic SaddleClip is designed for every rider who is serious about training and improving their horse’s performance. 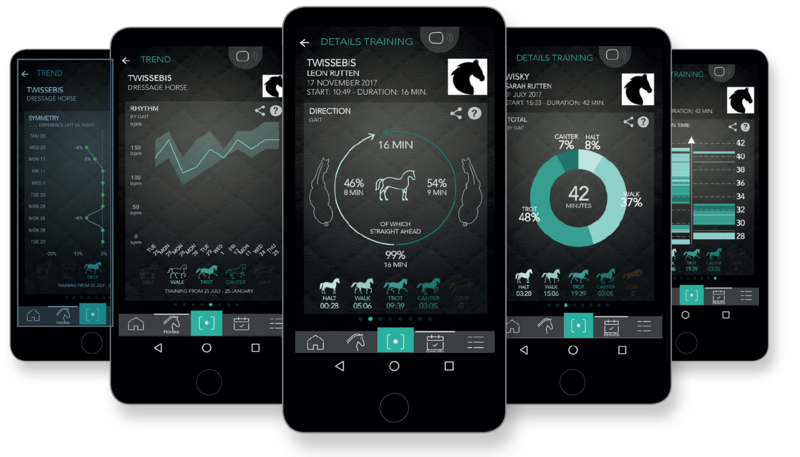 Basic measurements such as training structure, number of jumps, training on the left and right hand, training at each gait and symmetry show the actual load of the horse and are analysed in real time. Qualitative analysis, such as of rhythm and power of its push off, gives an insight into the horse’s development over a longer period of time. Train your horse to become a “Happy Athlete” and raise your own awareness of progress made. How many horses can I track with one SaddleClip? The number of horses is unlimited. You can track as many horses as you like with one SaddleClip. Sharing data is free of charge for you and for the people you share it with. For a tutorial on how to use the Equestic SaddleClip, watch the video below!